Environmental films dedicated to the human experience of the world around us. 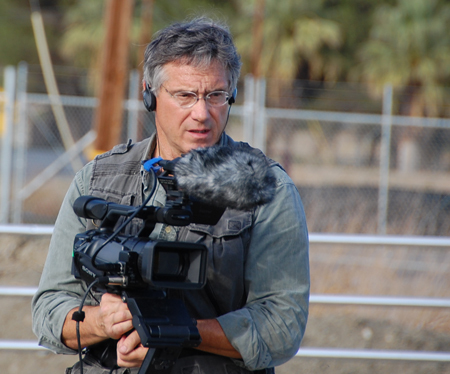 Christopher Beaver produces and directs documentaries and special media projects concerned with the environment or as he prefers to say, films about the human experience of the world around us. Christopher teaches documentary and narrative film production, cinemtography, and digital journalism. Among his films are DARK CIRCLE, NAGASAKI JOURNEY, BETWEEN DREAMS AND HISTORY, TALES OF THE SAN JOAQUIN, RACING TO ZERO – IN PURSUIT OF ZERO WASTE, TULARE – THE PHANTOM LAKE, and RECUERDO. A recipient of MacDowell and Guggenheim fellowships, Christopher’s additional awards include a National Television Emmy, a Certificate of Special Merit from the Documentary Committee of the Academy of Motion Picture Arts and Sciences, and a Grand Prize in Documentary from the US (now Sundance) Film Festival. NEWS Christopher is now available for individual film consulting and instruction. "Vital for bringing to light the importance of considering future generations when managing current resources." As we face global warming, we have also been given the opportunity to better manage water by restoring natural systems. One such system may be restoration of Tulare Lake in California's Great Central Valley. Once the largest freshwater lake in North America west of the Mississippi River, the lake bed today contains less than five percent of the original natural habitat. The rest of the natural landscape has been converted to large-scale farming of such crops as almonds, cotton, tomatoes, and grapes. California's largest reservoir is natural, the annual snow that falls in the Sierra Nevada Mountains. With global warming, there is less and less snow to hold the water that now falls increasingly in the form of rain. Drought adds another dimension to the problem. The question arises, how to store California's water from snowfall and rain in the winter season to water farms and provide drinking water in the dry summer. Rather than build new dams in California's mountains, restoration of Tulare Lake and other natural systems may hold the promise of providng a natural reservoir for farming as well as for natural habitat and recreation. Here's a preview of Tulare, The Phantom Lake – Drought Edition. Running time 90-seconds from Christopher Beaver on Vimeo. In addition to purchasing available films from Green Planet Films, I encourage people to donate basic support for my efforts, an overall project called Experience the Environment. Every amount donated expands my ability to provide low-cost screening options for those with limited financial resources, to advance filming of updates to Tales of the San Joaquin and Tulare, The Phantom Lake – Drought Edition, and to open the door for new films. Current projects include Tulare, The Phantom Lake, Volume 2 – Restoration Edition and Recuerdo – Land, Water, Art – A Portrait of New Mexico Artist, Nicholas Herrera. To make a tax-deductible donation, all you need to do is click on the Donate button and you'll be guided to making your donation. As we enter the era of a new president, your concern for the environment grows ever more crucial by the day. Thank you for whatever level of support you can offer.